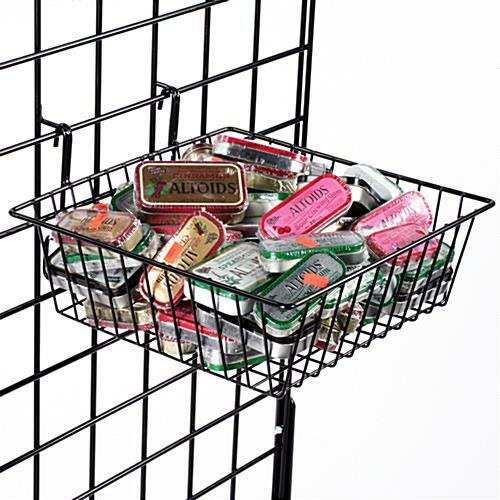 These Gridwall Baskets are Roomy Holders for Bulk Displays. Wall Mounting Display Racks Are Perfect for Impulse Items. 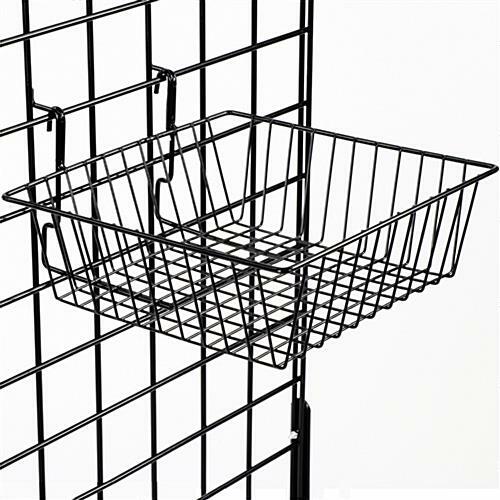 These Retail Store Gridwall Baskets Are Available Online In Many Different Sizes! Perfect for displaying smaller items in bulk. Rear-mount hooks attach easily to wire grid wall panels. Attractive black finish covers durable steel construction. 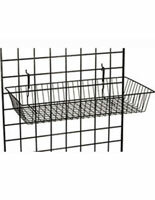 These gridwall baskets are black steel hanging displays for retail store use. Each of these racks attaches easily to wire grid wall panels using the hooks at the rear of the basket. These 12-inch square displays, 4-inch deep gridwall baskets are perfect for showcasing smaller items in multiple quantities. Toiletries and cosmetics, sale items, snacks, individual bagged goodies, even smaller sporting good items such as baseballs and hacky-sacks will catch customer attention when placed in these retail displays. These retail store fixtures, gridwall baskets for POS use can be easily moved to new locations as needed. These versatile merchandisers can be used effectively anywhere in a store. Specialty shops and department stores can use these wire bins, hanging gridwall baskets to showcase accessories such as wallets, bracelets or scarves. 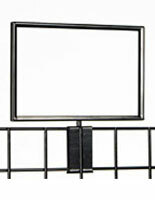 These multi-use merchandise displays can be used in groups or with other grid wall (not slatwall) accessories. 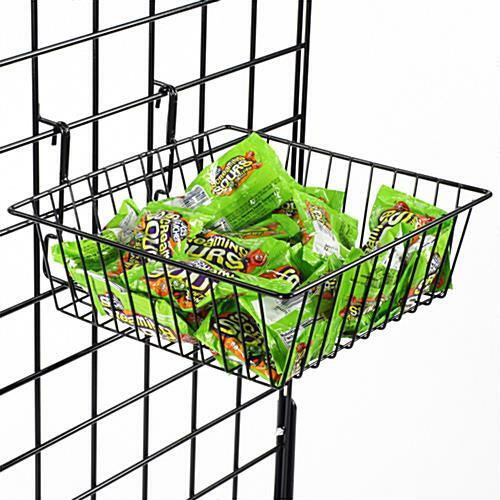 These gridwall baskets, also known as wire display bins, create highly visible sales stations for smaller items. The black steel construction of these units will coordinate with standard grid wall panels. These retail store fixtures are square gridwall baskets with a roomy four inch depth. 12.0" x 4.0" x 11.5"